So I’ve been noticing, upon up-close inspection of several plants, that some have a bevy of flies. At first I was impressed that they stayed so still when I was looking at them so up close, then I wondered if they were doing something gross like mating since they seemed so totally oblivious to me. Then the horrible truth that they were dead dawned on me. It’s strange that I work so hard on slaughtering any beady eyed flyer who frequents my home space but upon spying one dead on a flower stem seized from me a gasp of compassion. It was sad, disturbing, intriguing. It happened the first time several days, maybe a week ago. I’d noticed my rose bush in the ground out front wasn’t doing so great. So I went out there to give it some extra care: a little compost littering, removing some yellowed leaves, and the like. That’s when I saw a fly very near where a flower once was. The fly was very still. The fly, I realized, was dead. A few days later, I was out back paying some attention to a potted lavender plant when I saw several of them, then some more. Again, at first I thought they were live flies, just hanging out enjoying some sun. Then I realized they were dead. All of them, dead as door nails (why is it door nails would be deader than any other nail, I wonder). And after a wave of nausea and the creeps, it just made me very sad. They were clinging toward the top of the stem, just as the rose-loving flower had been. 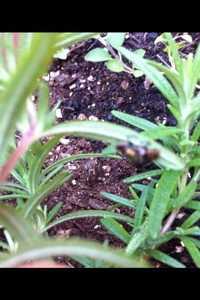 Then I also found them on the rosemary. It was a garden invasion of dead flies. Day of the dead … flies. Zombies of the insect world. I didn’t know whether to try to remove them or just let them be. Then I wondered if they were doing the plants any harm. So then I did what any other earth loving naturalist would do – I left the great outdoors for the glowing screen of my smartphone and looked it up online. This is what I found out. Seedcorn maggot flies or delia platura may sometimes be found dead on twigs or stems of flowers, typically toward the top of the stem, close to the flower. Their larvae may damage vegetables but typically don’t have a negative effect on flowers, trees, or vines. According to the research (and now that I’m not there I cannot personally confirm this), if you look closely you likely will see a pink stripe around the flies’ abdomens. The pink stripe is why the fly died. It’s the spores of entomophthera fungus. Once infected, the fly’s coordination is affected. They land on a leaf, vine, twig, or plant and die. It seems they are unable to fly away but it wasn’t clear to me if they sense the end is near. Maybe not, since they get all coordination-confused. This usually happens in the spring but can appear throughout the summer since the flies can breed five generations in one year. What confuses me is why I’ve never noticed this before. Anyone else seeing this? Anything else strange and kinda gross and not totally wonderful happening in the garden? As for the dead flies, they don’t easily flick off. Should they stay or should they go? Go ahead…gimme the dirt. I’ve seen quite a few tiny flies in my containers. All the ones I notice are crawling around in the soil. These things are tiny and could easily get mistaken for splashed soil on a stem or leaf. Next time out I’ll have to check the plants closer. I don’t know if these are the same bugs you are seeing though. With mine it seems they go away when the soil dries out, but on moist soil, especially if you shine a bright light onto it, you can see tiny things moving. Recently I’ve seen little tiny flies around my plants at work. I’ve noticed crawling on the soil there for some time. My best guess is they got there from the soil I took from home and it took them a while to hatch. Maybe I’ll dry some wormwood leaves, make a powder, and see what happens. Interesting… I haven’t seen those but I haven’t been looking either. If the weather holds out, I hope to get back in the garden this week, after being out of town last week. I did notice from taking just a quick peek at the lavender plant that the flower stem that had the flies on it is completely dead and bent over about in the middle of the stem, just about where the flies were. So, maybe so much for the research that said they posed no harm. I’ll check on the other plants where I saw the flies and give you an update. Btw, what do the wormwood leaves do? Wondering, too, how else you use the wormwood since you’ve mentioned it a couple times. Wondering if it’s something I would want to have growing in the garden too. Aside from occasionally eating a piece (it’s medicinal) I haven’t used it since it got rid of my ants last year. They still haven’t returned to those containers. I am planning on cutting many of the stems/ leaves and drying them out so I can crush them into what I hope will be ‘bug dust’ that is non toxic. I am debating on cutting the plant to the ground. After surviving the winter the main stem looks like wood and is nearly an inch in diameter. I wouldn’t mind except it is completely covering the deepest and softest section of my ground. If I can get another plant or two started I am more likely to cut the plant down and see if it grows back. I can only imagine what that root system looks like. Maybe I will try transplanting it to an unused section of the yard. I’ve yet to see any signs of wormwood being eaten by bugs. As for my eating it, the stuff is bitter. I forgot where I read it is one of the most bitter things known to man. Chewing it well will leave the taste in your mouth for over an hour even after drinking some water. Also from what I’ve read ingesting too much too often it can become toxic. Like Absynthe which uses wormwood to make it, there is a lot of conflicting information out there. However with 3000+ years of known medicinal use I think an occasional ‘snack’ does more good than harm. Seems most of the stuff that is medicinal can also be toxic if taken in too large doses. The question then becomes, of course, how much is too much. Since we haven’t gotten to the point where we are using the land in a way that makes sense (for example, instead of obliterating weeds with pesticides, exploring their potential beneficial uses), a lot of the information out there is anecdotal and sometimes conflicting. I got into a huge back-and-forth with my mother about the use of apricot kernels as a counter-carcinogen. She was up in arms after I made mention of it because her friend told her it would kill her. In fact, I hadn’t suggested she use it. I just noted that some people who have used it have become cancer-free, and swear by it. It ended up turning into something of an argument, which I really didn’t like. I’m not sure why it seems many people who are Western medicine-only advocates get emotional about those of us who consider alternatives. The Western diet clearly is toxic. The over-use of chemical laden products is killing us. And I think in time the effects of Western medicine will reveal themselves to be often more harmful than good. Meant to ask what the medicinal effect of wormwood is? I have seen this in my garden on an ornamental grass. My wife and I were noticing a dead, rotting smell in the area. We figured a dead mouse or mole but could not find anything in particular that was causing the smell. Then the next day I was doing some cleaning in the garden bed and kneeling down noticed all these dead flies on the previously mentioned grass. They were near the top on the underside of the grass blades, dozens of them. Pretty grim. I did not see any pink stripes to indicate the fungus. However, I did read that if the flies were feeding on the honeydew left by aphids that may have been feeding on the grass blades, then the flies may have been infected by a virus, bacteria, parasitic worm or some other pathogen from the aphids. Whatever the reason it’s down right creepy. I plan on trimming the plant to get rid of them and the smell. Interesting! (and, yes, creepy too!). Next time I’ll check for a smell. I didn’t notice it this time, but the plants I mentioned (a lavender plant, some herbs, and a rose bush) were all pretty far apart (the rose bush is in the front and the others are in the backyard), so maybe that’s why there was no noticeable smell, since they were not close together and concentrated. I don’t know if you saw the comment of another reveler, Ralph, who mentioned that perhaps neighbors nearby were using pesticide and the flies had come in my yard as a final resting place. That’s a possibility too. What was particularly strange about it, though, was the way the flies clung to the stems of the plants, mostly near the top. That seems to fit with what I found online that suggested these flies were dead seedcorn flies who have been infected with a fungus called entomophthora. 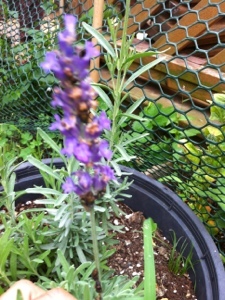 (See http://www.ehow.com/facts_7719575_mean-flies-stuck-plants-garden.html). What doesn’t fit so much is that, according to the brief research I did, I would have expected to have seen these flies earlier in the season as well, not at the hottest part of summer only. Also, according to at least one article, these flies don’t damage the plants they land on, but that did not appear to be the case with mine. In fact, on the lavender plant, the one stem that had the flies dried up and died, while all the other stems (and lots of them) were perfectly fine. Another thing that does not fit with the fungus theory (or at least does not seem to fit the pattern) is that this is the only year I have seen this phenomenon and I’ve been gardening the same plot of land for more than ten years. There doesn’t seem to be a ready explanation for what might cause an increase in this type of fungus if that is in fact what it is. Thanks for posting! Please post more. I once was an anthropology/archaeology student. We went on digs in the summer and sifted through what was left behind by older cultures. One day, when folks are trying to piece together what happened to this planet, I imagine that they will sift through online correspondences like these and answer this puzzle for us. I wonder if any of your neighbors are using insecticides or use lawn products with insecticides in them. Maybe the flies are fleeing from elsewhere and your garden is their last stop. I too seem to have seen fewer butterflies and insects this year, and smaller creatures of all kinds. I spotted a total of one ladybug, and that was in the ceiling in a room in my house. My next door neighbors undoubtedly use some kind of pesticide. Their lawn is too green not to. It’s a regular suburbanesque type lawn of all neatly trimmed hedges around a perfectly square patch of grass. Their father, who grew up in the house and passed away a few years ago somewhere in his late 80s, used to tell me what the neighborhood was like back when he was a kid, back when the nearby expressway was nothing more than a grassy hill he used to sled down as a kid and when a neighborhood school was a bowling alley, and we boasted one of the most popular movie theaters in Brooklyn. All these things my neighborhood is lacking now (too few hills and zero bowling alleys or movie theaters). I remember him one time saying, as he watched while I struggled to get a good lawn of grass going (something I smartly gave up about ten years ago), “You know what kind of plant grows best in Brooklyn?” Me: No, what? Him: Weeds. Someone I used to work with started gardening again this year. Maybe my bringing up garden topics countless times with him gave him the final nudge needed to start again. A couple nights ago I mentioned the hugh drop in bees and butterflies and he said he had noticed the same thing. Being in Queens he is not very close to me which leads me to think this is a widespread issue. I suspect that’s why my tomatoes and cucumbers which have produced many flowers have yet to produce a single fruit- lack of pollination. About the only flying insect I see in any numbers are wasps, and not a whole lot of them either. From what I’ve heard, aphids will often attract ants. 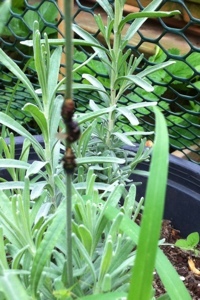 Ladybugs (which I’ve seen exactly one this year) like to eat aphids. As Bill said, ants are also attracted by the aphid’s honeydew. Have you noticed ants or any other critters around the dead flies? I’ve heard of apricots and cancer for some time. I believe the apricot pit/ seed contains arsenic. From what I understand (which may be wrong) the fast growing cancer cells uptake the arsenic faster than healthy tissue and are poisoned. Almonds and grape seeds also contain arsenic, and I believe more than a few eaten grape seeds can be a problem. Once you accept the disclaimer you can access their herb data. Check Red Clover (a common medicinal herb), and Stevia (sweetener) for starters. Interesting how they have an herb database, and perhaps more so that herbs with potential ant-cancer properties are left waiting on more study. There’s a link to a free PDF in the podcast. Many sources must be checked, cross checked, and evaluated when it comes to alternative medicine. Govt agencies pretty much forbid it, and in certain instances they are correct in doing so. I believe in most cases they are protecting corporate interests. There are herbal remedies that have been in use for a thousand or more years that are forbidden, and known dangerous toxins allowed in our foods along with things like mercury in vaccinations which govt agencies push as if they were illegal drug dealers (flu vaccinations). Things like fresh whole milk, fresh eggs, and cheese are being attacked while our food labels look like a science experiment gone wrong. I’ll do my own research and make my own decisions as to what I eat and drink. I don’t need Monsanto or any other company telling a politician what to tell me I can eat. The human race has survived for tens of thousands of years without the FDA and USDA telling it what to eat. I think I’ll have a piece of Wormwood now! Just moved into an apartment and was about to clean up the yard and noticed all of the weeds and various plants have dead flies near the tops of the stem. Moved the leaves around, but the flies didn’t budge. I’ve never seen such a thing before, there must be hundreds of dead flies in my backyard. I’m debating whether or not to remove all of the plants. I’m curious where you live. I noticed this in Brooklyn and I think I heard from others here and Staten Island seeing this too. What strikes me as particularly odd is that my research suggests it’s harmless to the plant (although of course not to the fly the fungus kills) but that hasn’t been my experience because what I’ve seen is that the affected part of the plant turns brown and dies shortly thereafter. I’d watch the plants to see what happens to them. If you’re seeing pieces turn brown and die, I would cut them and put them in plastic bags and throw them away (in other words, don’t use in your compost if you want to be extra careful). I’d consider saving a couple though in case you want to have it tested. There’s a school that does reasonably priced soil testing – maybe Cornel? – that may be interests in it. I live in Albany, so it seems this problem is wide-spread through out the state. Good call on putting the plants in bags to make sure they don’t end up as part of the soil! I don’t think any of the weeds and plants out there are dead, but to be fair after realizing the flies were all dead I was a bit freaked out and went inside to research. Will look again tomorrow. I am also getting these all over my garden. However, none of my plants have been damaged at all by them. It’s weird because I have never seen these before and I have been gardening in the same spot for a very long time. It also looks like they are merging I guess you could say with the leaf or stem? Or like they are decomposing inside of the leaf. I can’t really explain it. I live in northern Indiana. With the bees and butterflies I was reading articles on them about 2 weeks ago and there is a decrease in them. They are actually worried about some bees going extinct. But, I have seen more butterflies in my garden this year than I ever have.. Weird eh? On Staten Island (NYC) I’ve seen very few bees, butterflies, lady bugs, and a few wasps. All far less than usual. Last year and before I would regularly see bees hovering about and actually hear them hit my windows- not this year. It’s raining today, but I will go into my garden and check for dead flies. I haven’t planted anything in the ground this year so I really haven’t checked it much. Testing sounds like a great idea. I would put on a pair of rubber gloves (not knowing what this is), cut a sample and close it in a glass jar. these flies large enough to actually see that they are flies and not some crawling critter? Just curious since I haven’t seen any yet. Also, great idea on cutting ‘infected’ plants down and throwing them in the garbage. I knocked them all off and gave the tree a good bath with insecticidal soap. I just brought it in for the winter and I saw as I was inspecting it, one dead fly on the underside of a leaf. I wish they didn’t so disgust me. top as well as defined out the whole thing without having side-effects , people could take a signal. The dead flies in my flower gardens are everywhere for the last 3-4 weeks. They don’t appear to be striped, pink or any other color, but they are definitely dead and STUCK! I have not yet found an adequate method of removal. Help? Ive noticed the dead flies also. Untell this summer i never knew this could happen. It must be a year of the fly, and it looks horrible to see so many. I do have a question, is it the plant that gives off this fungus and do i need to worry about my plants?